← Peter Boghossian and Megan Glavin: What Happens After Prison? 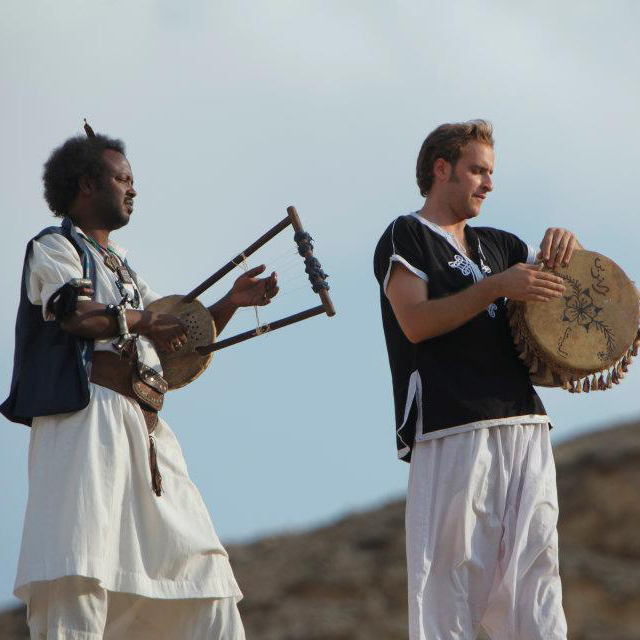 Ahmed Said, Abuamana “The Prince of Kassala” is an ethnic Beja musician of the Hadendoa Tribe of Northern Eastern Sudan was a guest on Paradigms in 2010. Now he has teamed up with with Miguel Merino to form Otaak Band bringing together traditional Beja music with Jazz and the Blues on a new CD called Bejawiya. Aaron Jakes who plays sax is also interviewed, as well as returning guest s well as returning guest Omdas Milad Qam-hat Ma’ahes Sah Uriel, an ethnic Beja of Bishari and Mahas descent and raised in the United States. Joaquin Pacheco and David Ortega from A Place Called Home join Paradigms for the first in a series of interviews with some of the young people making music at APCH. Music by: Otaak band, Ahmed Said, Little Feat, Bobby Treasure, Nirvana, and Bob Marley & The Wailers.